HP introduced the 100 Series in 1981, beginning with the 125 . The 100 Series machines were unique in a number of ways. These computers were the first from HP to be primarily designed for business professionals, rather than engineers or scientists. Unlike previous computers from HP, most of the software that ran on the 100 Series machines was not written by the user or by HP. The 125 was followed by the 120. Both of these machines had Z80 processors and ran Digital Research's CP/M operating system. 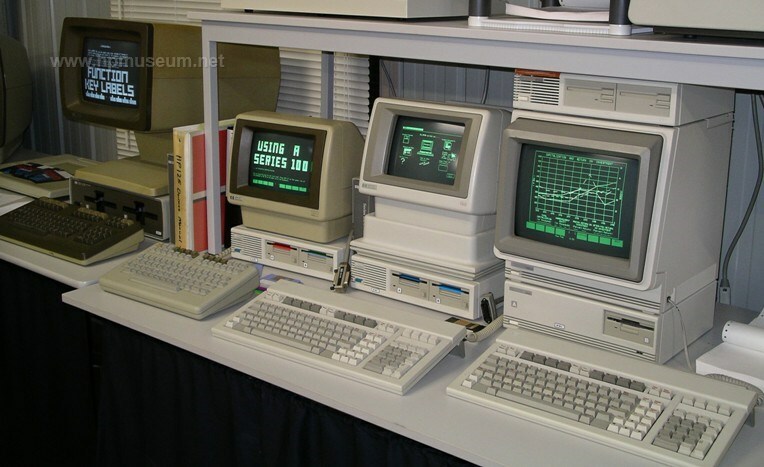 These computers were able to run a wide variety of software , most of which was not written specifically for an HP computer. HP quickly realised that IBM's PC-DOS based personal computer was going to attract much more support from software vendors than were CP/M based machines. So, HP introduced the 150 Touchscreen in 1983. The 150 was HP's first MS-DOS based personal computer (although it was not IBM compatible). The 150II replaced the 150 in 1984; development on this series ceased shortly thereafter. It was replaced by the fully IBM compatible Vectra range in 1985. For more information on these products, be sure to sure to visit our HP Series 100/PC Communicator library. The museum has an extensive collection of software available for download for the 150 Series. Click here for the software listing. The museum also has a collection of software available for download for the 120/125 Series. Click here for the software listing. Click here for the museum's software listing for the Portable and Portable Plus.